Family tile games are based on either a set of dominoes or a set of Mah Jong tiles. They may not be as popular as Card games or Board games but they still provide hours of fun for very little money. Dominoes originally came from China although the regular sets used in the West today are only about two hundred years old. They are available as either wooden or plastic tiles with spots on each end. Most games use a double-six set which has from zero (blank) to six spots at each end. 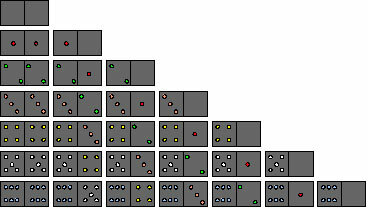 There are 28 tiles in a double-six set, shown below. The colour of the spots does not matter; some sets have spots of only one colour. Some family tile games use a set of 55 double-nine tiles, which are useful for larger groups. You can even get a set of 91 double-twelve tiles. Individual dominoes are called tiles, stones or bones. Dominoes with an identical number of spots on both ends are called doubles. Chinese dominoes are similar to normal dominoes but are slightly longer and narrower. 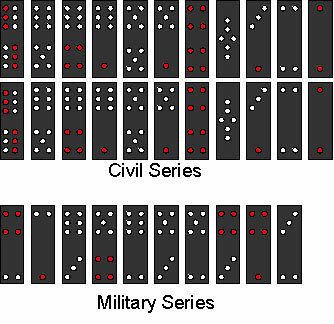 There are two series, a civil series and a military series which make up the complete set of 32 tiles, with no blanks on Chinese dominoes. Note the difference in pattern of spots on the Chinese double three tile. Chinese tiles are also coloured with fours and ones in red, double six in red and white and all other numbers in white. It is possible to make a set of Chinese dominoes by combining certain tiles from two sets of double-six dominoes. Mah Jongg is also derived from an older Chinese game but only reached the West in the 1920s. In Mah Jongg, there are 144 tiles with different pictures on each tile. Regular domino tiles cannot be used for Mah Jongg.